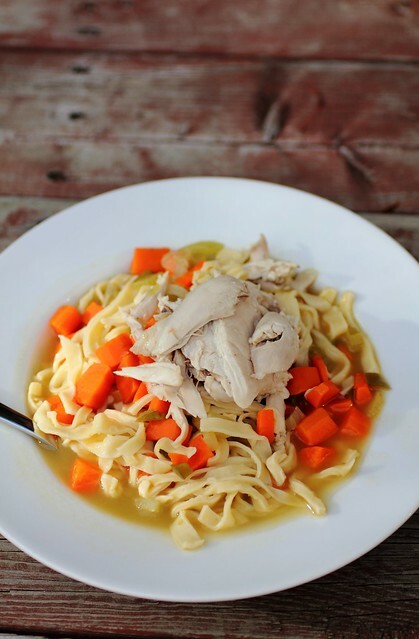 With the mild flu symptoms I've been experiencing lately chicken noodle soup just seemed like the perfect remedy. At the grocery store this week I picked up two whole chickens. I removed the 4 breast segments for General Tso's Chicken dish recipe. The remaining carcasses (minus 2 legs) made a lovely concentrated stock. 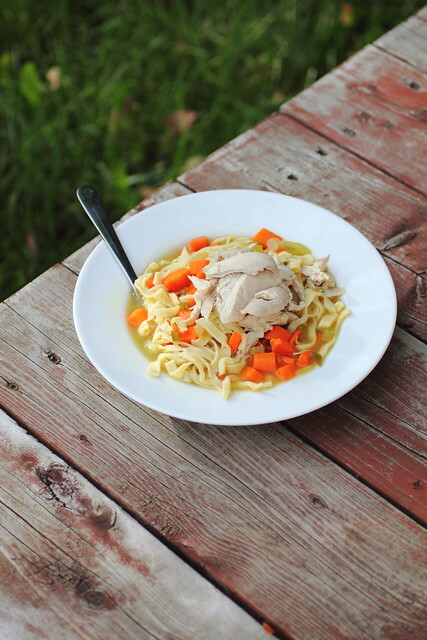 The bones are the secret, even if all the meats are removed it still makes a good stock, and even if the carcass is a leftover from a roasted chicken it makes a lovely variation of stock! Add cold water to the chicken and set on medium low heat - never boil as it will cause a cloudy soup (something about the bones releasing something.. ) but its a bit of trouble clarrifying if that does happen. Now just leave it alone. 3-6 hours or more. Checking from to time if there is enough water and adding more if the levels go down. When it's done strain out all the bones and limp veggies and that's it! If you have meat on those bones you want to remove them about an hour into the cooking when they're tender and flavourful, any longer and they lose flavour so just pick off the pieces with a pair of tongs and set aside for later, then let the stock finish cooking. I like to refrigerate it and remove the layer of fat off the top then it's ready to use so making it a day in advance is good. Let this come to a boil and simmer for 20-35 mins or until veggies are tender. Make a well with the flour, add the eggs and slowly incorporate it into a dough using your hands, once it's smooth and yellow divide and wrap in plastic. Let it sit for 30 mins to rest. When you're ready to make the pasta roll it out (dusting board or counter with some flour) and using a rolling pin roll it very thin. If you have a pasta machine this is a good time to use it! I like to be able to see the counter through the pasta so it should be thin and evenly rolled out. Use a knife or pastry knife/cutter to slice thin strips and then cut it horizontally to create shorter noodles of 2 inch strips. At this point you could use a slotted spoon and strain out your veggies into a big bowl. In the pot with the stock add the noodles as you cut, work quickly and keep adding them in and let them cook briefly. Add your veggies back in and pieces of chicken meat set aside. 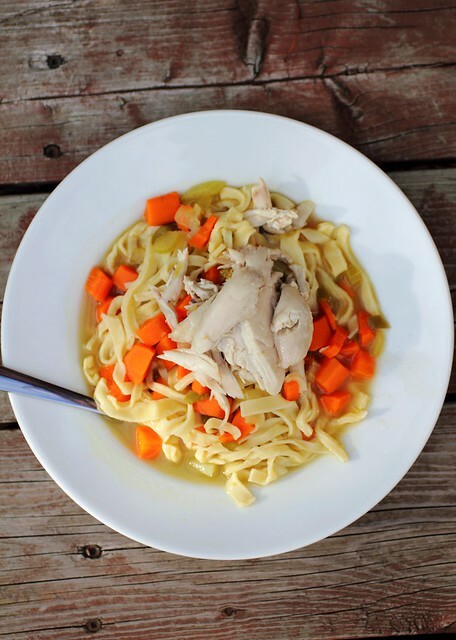 This is an awesome chicken soup recipe. 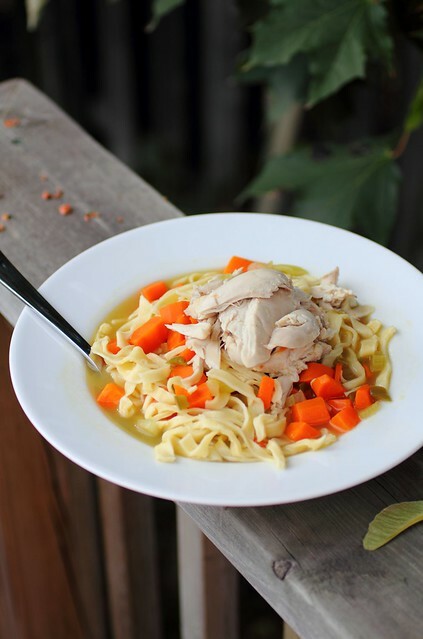 Of course, there are thousands out there, but I love how you go completely from stock to noodles. I will definitely be making it this fall!